There is no name on this sign. Only the pointing finger telling where to find the office and pockets. Pockets, however, was a term used to designate storage sites for coal during the era of the coal burning stove and furnace. The Merriam Webster Dictionary defines coal pocket as "a plant equipped for the storage and loading of coal especially for retail distribution." 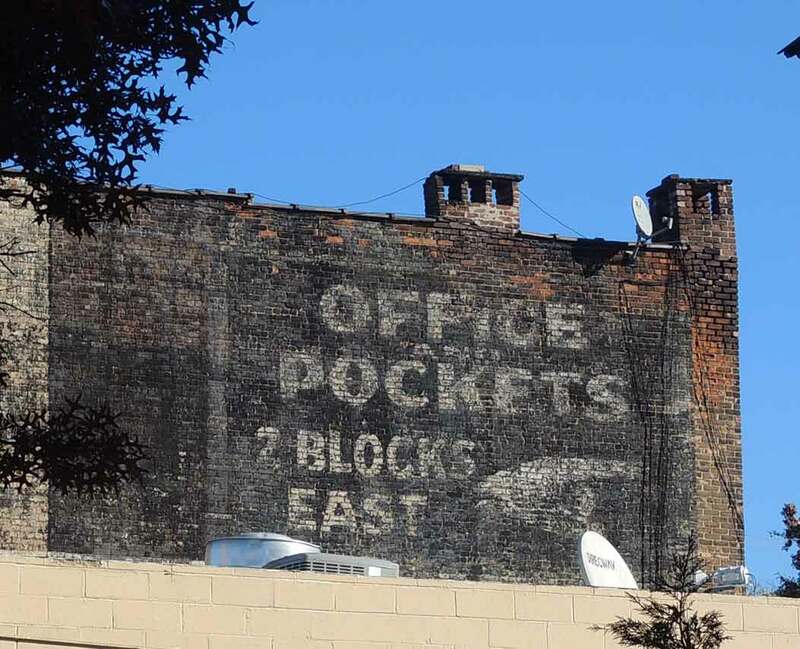 A likely candidate for an office and coal pocket two blocks east of Morris Park Avenue and Holland Avenue, the Bronx, is the Starck-Rawlings Coal Co., who were located at 1645 Holland Avenue from 1925 to 1946. Proprietors at Starck-Rawlings were William Lewis Starck (1882-1939) and Francis Joseph Rawlings (1875-after1945?). Of the two, Francis J. Rawlings seems to have been involved in coal and ice sales first. (Coal and Ice were traditionally connected industries: coal in winter, ice in summer.) What looks like Frank M. Rawlings was recorded in the 1905 New York State Census, age 30, living on St. Anns Avenue, the Bronx. His occupation was "Ice (Wholesale)." Then in 1918 he registered for the World War I draft, age 43, "Ice & Coal Dealer Self Van Ness Station NY NH & H RR Co." This locates the business at the Van Nest station of the New York, New Haven and Hartford Railroad. Railroad.net shows views of the Van Nest Electric Shops beside railroad tracks in the Van Nest neighborhood. A little of the history of the Van Nest neighborhood is found at http://research.omicsgroup.org. Rawlings disappeared from New York directories after 1945. It is possible he died around this time. William L. Starck, age 36, born 10 July 1882, registered for the World War I draft in 1918 when he was an auditor at D. L. & W. Coal Co., with offices at 120 Broadway, New York City. D. L. & W. was the Delaware, Lackawana and Western Railway. Material relating to the D. L. & W. Coal Co. can be found on the Hoboken Historical Museum website. Starck and Rawlings came together as Stark-Rawling Coal Co. in 1924, located first at Van Nest Station, and then in 1925 at 1645 Holland Avenue. In 1947 the company became a division of Household Fuel Corporation. Household Fuel Corp. had several locations in the Bronx including 1645 Holland Ave. until 1952 when the Bronx telephone directory listed them solely at 1416 Ferris Place. This was their location through 1976. The real estate website www.realdirect.com lists (in 2017) two former Starck-Rawlings properties that were sold in 1977. These are 1416 Ferris Place Bronx NY 10461 and 1451 Blondell Ave. Bronx NY 10461.